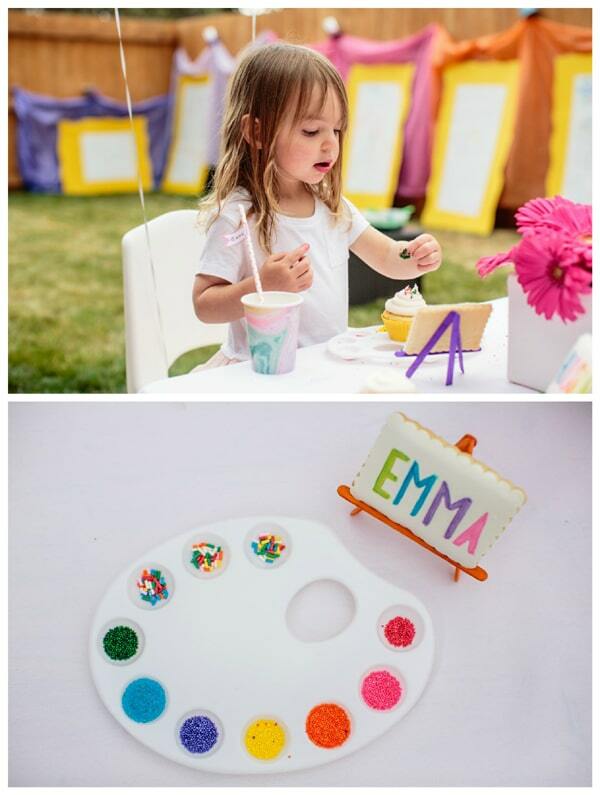 This super fun Kids Backyard Art Party Idea features life-size easels, cupcake decorating, adorable personalized cookies, and 3 awesome cakes! 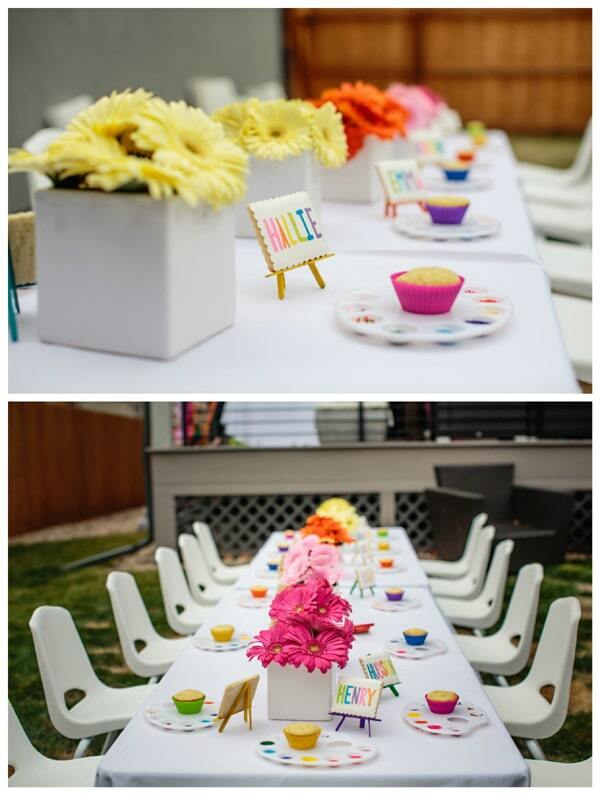 Everyone had a blast at this interactive birthday party for 2 sisters thanks to party planner mom who had the most creative ideas for this party! 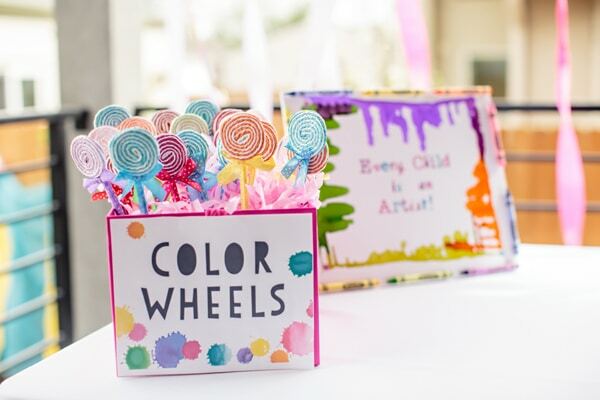 From Brynn Swanson of First Look Events: When I set out to plan my daughters 3rd birthday I knew I wanted something that would be fun for all of the kids. 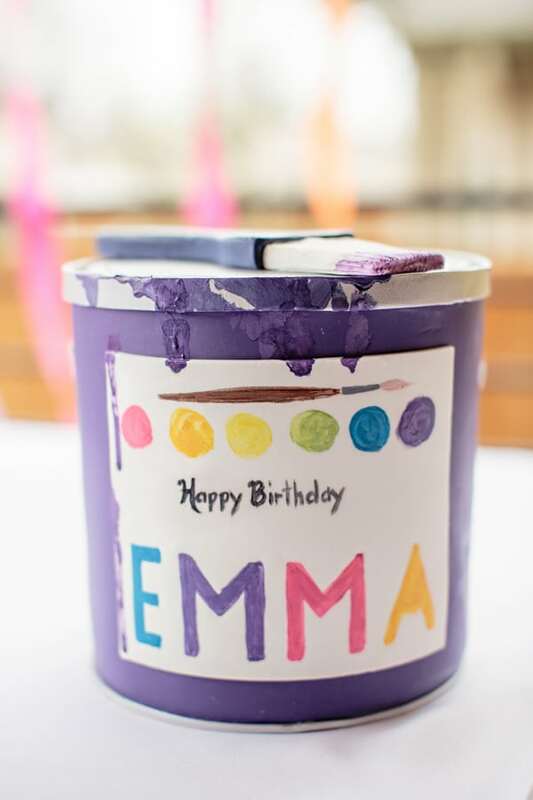 I asked Emma what she would want and she quickly said an “art party.” I set off to create a beautiful and fun joint birthday party for my two girls. Being an event planner for a living allows me to create beautiful events for other people, but this was the first time I could be my own client! I knew I wanted something fun and interactive for the kids. 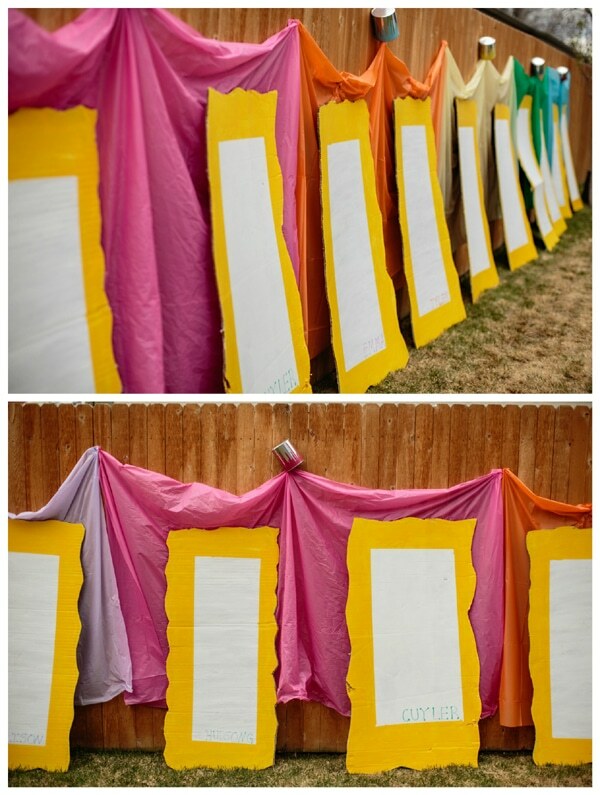 I came up with the idea to cut and paint old refrigerator boxes into life-size easels for the kids. 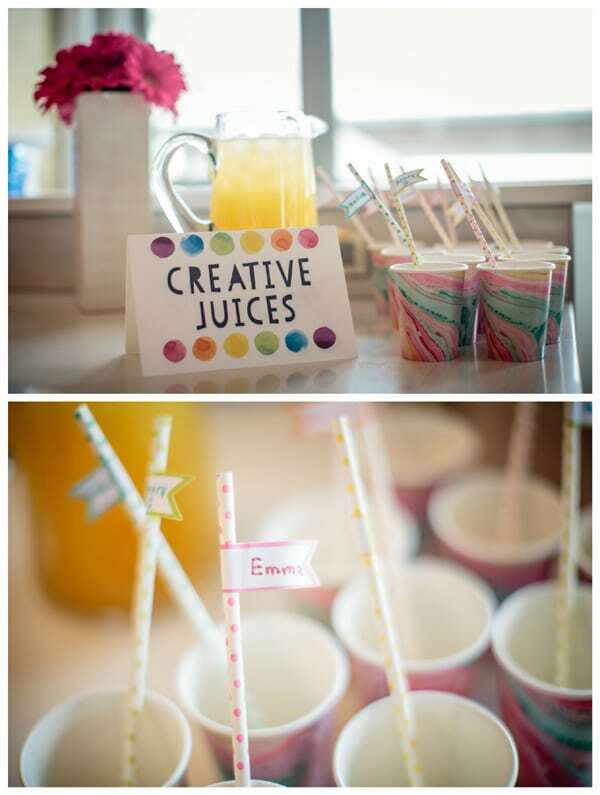 The creation station featured paint pens, markers, artists wipes, (wet wipes) and bubbles. I put all natural food coloring in bubbles and when the kids blew the bubbles onto the canvas they popped and created art. Each child had a canvas with their name on it and had a blast creating works of art. 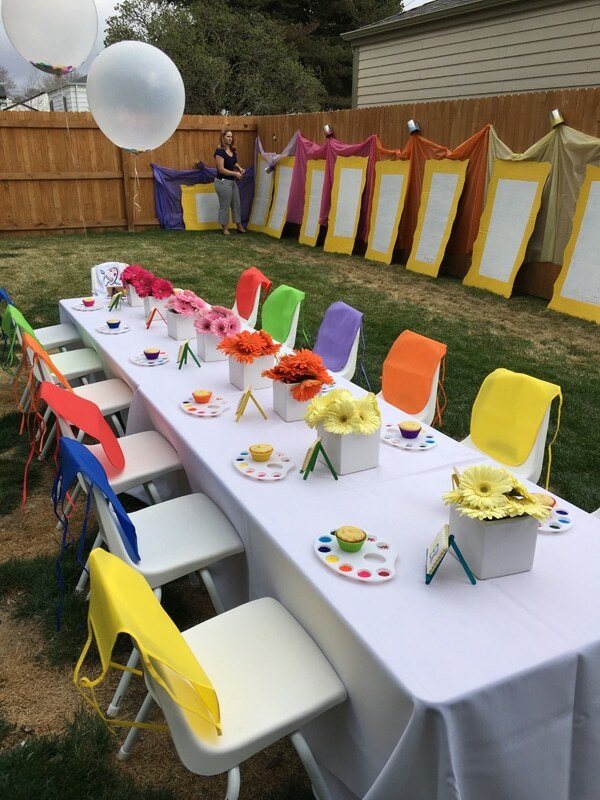 To create a dramatic backdrop, and protect our fence, I ordered plastic tablecloths that I hung so they looked to be pouring out of paint cans. 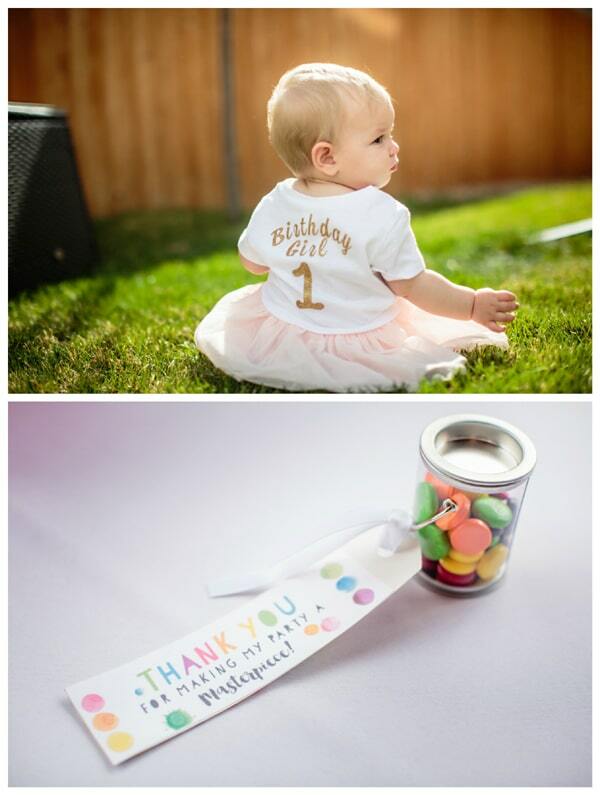 I designed the stickers for the paint cans to match the balloons, streamers, and tablecloths. After creating masterpieces of their own, the kids found their cookie place cards and went to work decorating their own cupcakes. 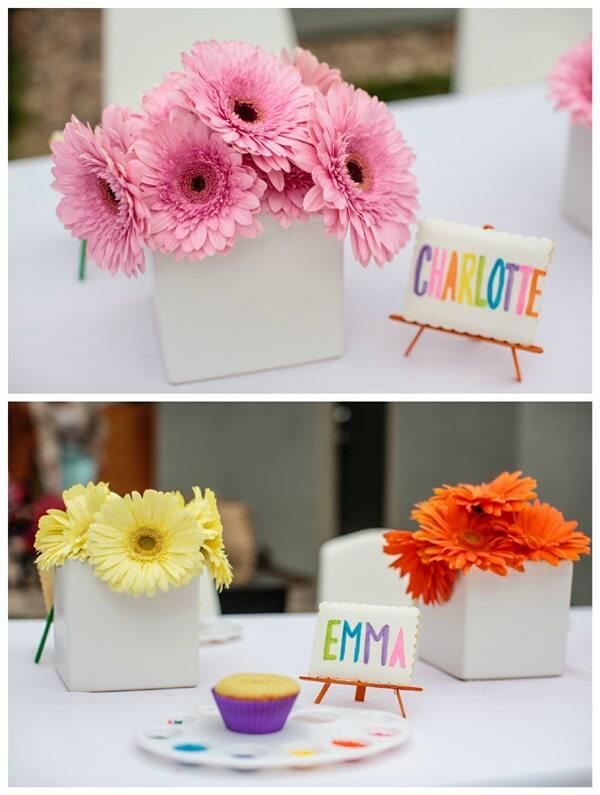 One long table featured brightly colored flowers, aprons and cupcakes for each kid. I made the easels that held the cookies out of colored popsicle sticks! Cake is probably my favorite part of any celebration and I definitely passed that love on to my girls. 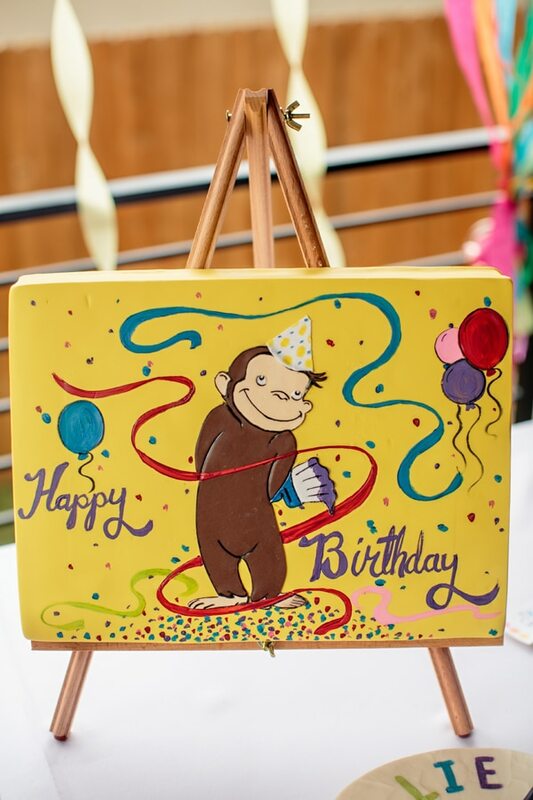 Emma’s cake was a painting of curious George, which happens to be her favorite book, accompanied by a paint can made of cake. Her sister’s 1 year smash cake was a painters palate. 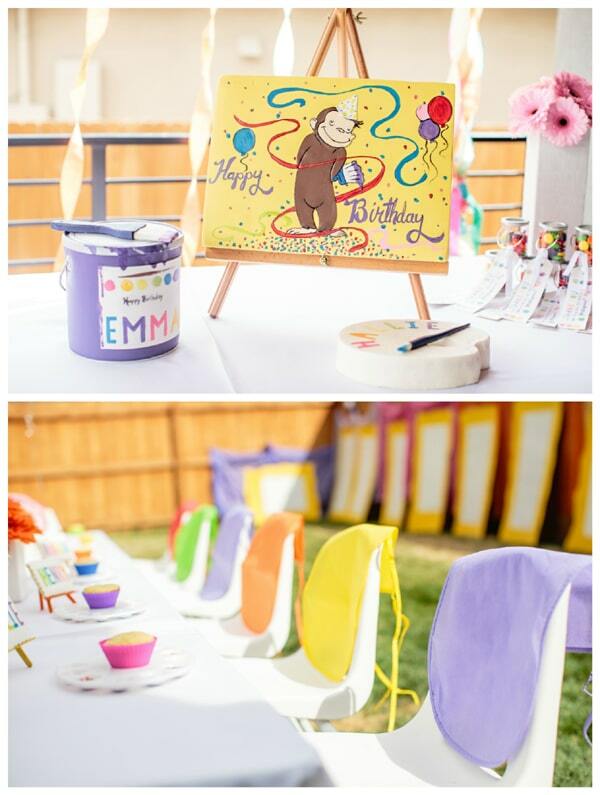 YES … the yellow Curious George “picture,” paint can and palate are all 100% cake!!! The moment Emma walked into the backyard and started pointing out every little detail I knew this would be a party both of us would never forget! 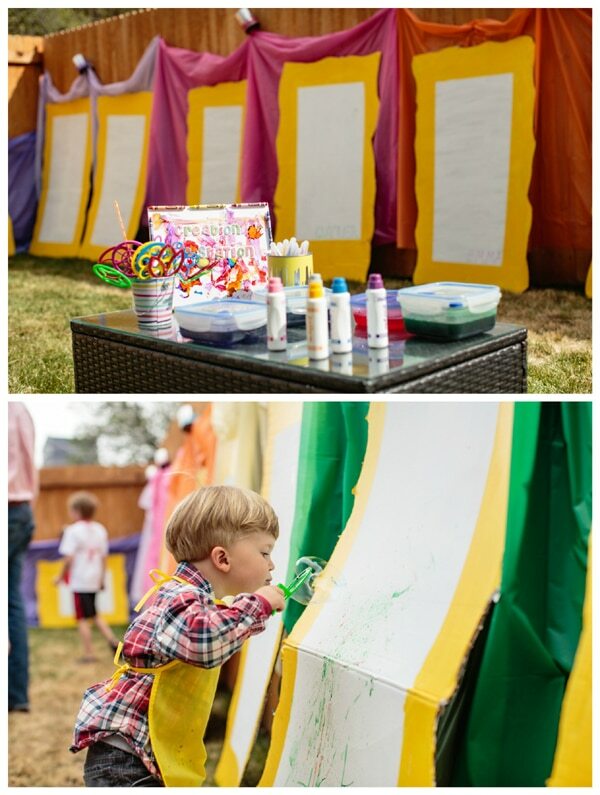 What an amazing Kids Backyard Art Party Idea for any little one’s birthday! Do you have a favorite detail from this party? Let us know in the comment below! This party feature contains affiliate links. Please read our full disclosure policy. 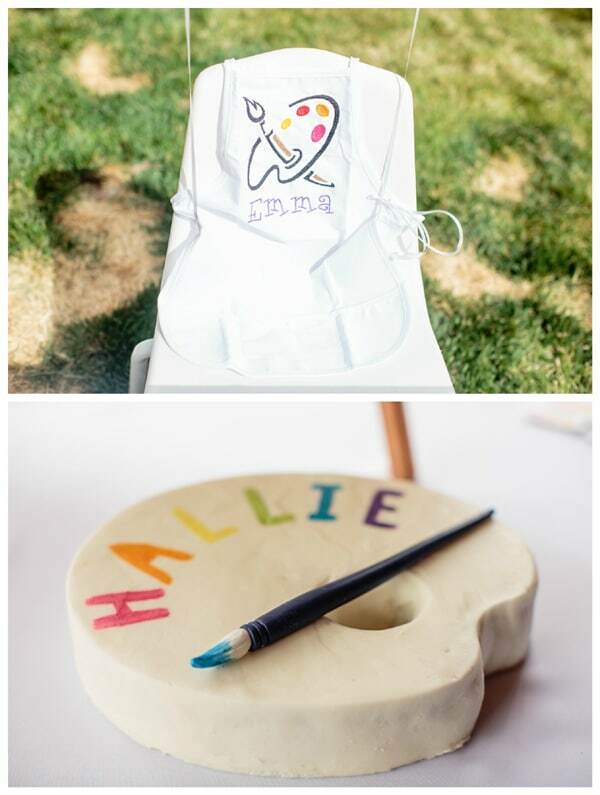 Plan a fun kids outdoor art party with these fun products! 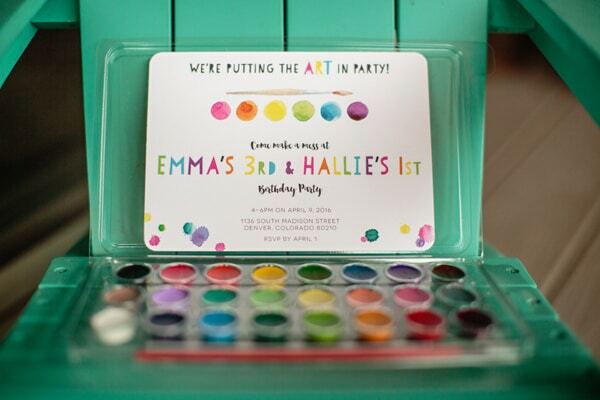 Sign up for a FREE 30 day trial of Amazon Prime and get FREE 2-day shipping on your party products! 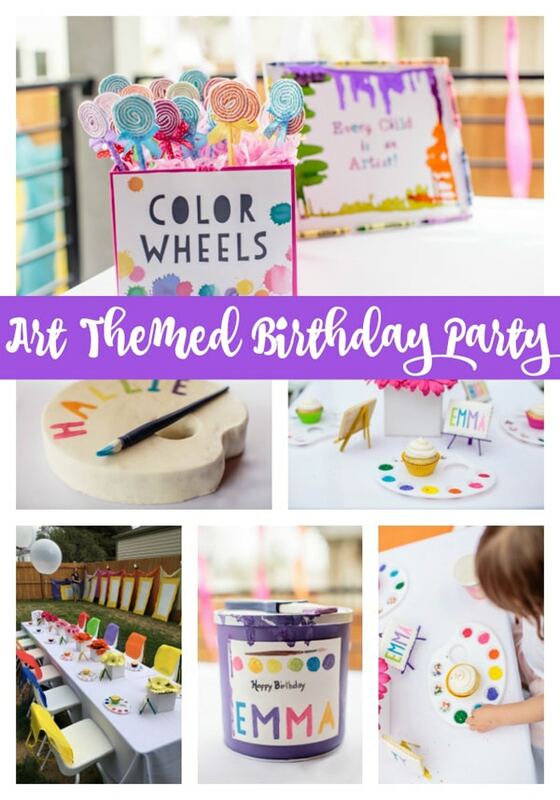 Check out these other art themed party ideas on Pretty My Party! 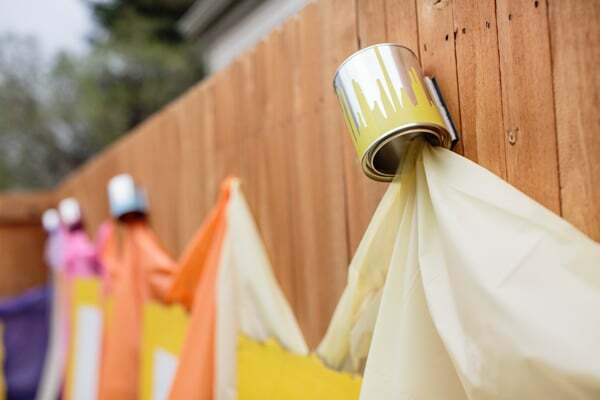 how did you hang the paint cans? seems like a stupid question, but I’m intrigued! thanks!